My husband is from Louisiana, so Cajun is his middle name. To say he likes all things seafood, spicy and punching with flavor is an understatement. If he could, he would live off gumbo daily! Unfortunately, due to his gout, he no longer can have those tempting bowls of seafood gumbo. Seafood triggers gout terribly and the pain is not worth it…..or barely worth it, he’d say. Since I can’t serve him seafood and definitely not chicken or sausage, I’m left with creating dishes with the flavors of Cajun. Minus the meats, this dish satisfies his taste buds fairly well. I quite enjoy it myself. If you are unfamiliar with quinoa, it is a grain that is very high in protein and a quality protein at that. There is white quinoa and red quinoa. The red quinoa has a more rustic texture which I love. Slow-cooked red beans is the secret to these amazing cajun dish. They really soak up the flavor and have the most incredible texture that you just can't get from canned beans. Wonderful, deep cajun spices and heat make this dish addicting and is also super filling from the quinoa and beans. 1 lb bag of dry red kidney beans Making them from scratch yields fabulous tasting beans! Do not skimp on these! Ahead of time prepare the red beans according to package directions either overnight or early in the day. I went ahead and used the whole bag just to have extra beans, but you will not need all of them at the time of this recipe. This will need to be done in advance prior to making the quinoa and veggies. Once you have already done the soak method of the beans, you can then cook them. Follow the cooking directions on the back of the bag. Prepare the quinoa. Add the quinoa, vegetable broth and all the spices, including the bay leaves, into a pot. Bring to a boil. Once boiling, cover and turn heat to low and cook for 20-25 minutes or until almost all of the water has evaporated, stirring a few times during the cooking process. Once the water is almost gone, turn the heat off, return the lid and leave covered for 5 minutes. Remove the lid and fluff with a fork. While the quinoa is cooking, prepare the vegetables. Pour a few tablespoons of broth in a large pan and turn the heat to medium low. Add the bell pepper and onion into a large pan. Add some salt and pepper. Once they are almost tender, after 5-10 minutes, add the garlic and cook until all veggies are tender stirring often so the garlic doesn’t burn. Add more broth if necessary. Turn the heat off. Combine the veggies and quinoa. 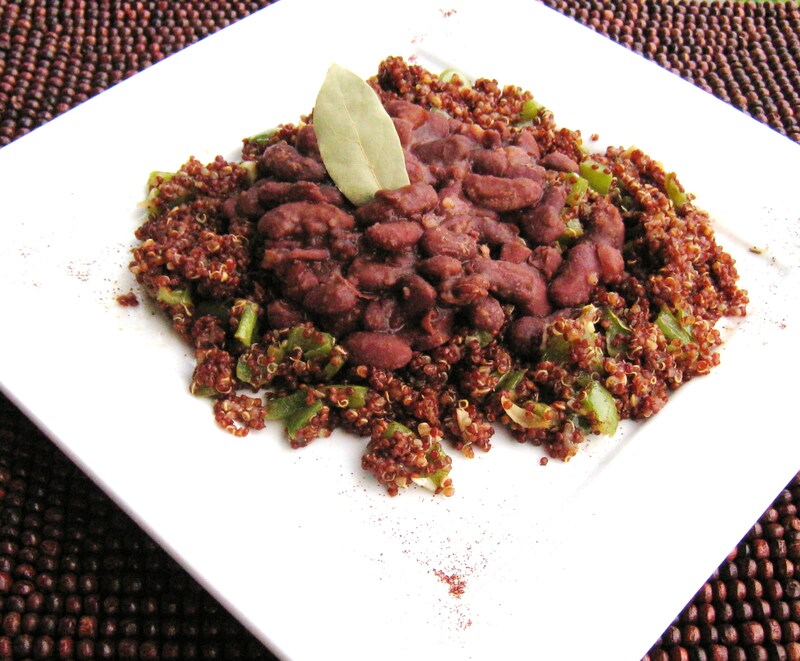 Serve by plating with the quinoa mixture and adding the cooked beans on top. Season with extra salt or cajun spice if desired. This sounds awesome! If I don’t have spicy, some kick, at least a couple of times a week, it feels like something’s missing….I may have to make this one today.. Thanks for my meal today lol! Plan to make this tomorrow – beans are soaking now. I’ll let you know how it is!! “Ok I just made this for my family and they all loved it – all three kids and husband!! This is definitely a keeper. Great flavors and just delicious!! Thanks Brandi!! It’s quite delicious with a good kick of spice, it’s one of my very oldest recipes, but a delicious one! Can’t wait to hear what you think! I was hoping for a gumbo recipe. Have you made any of those. I know when I find a recipe by you it will be delicious. I share your recipes and always recommend people look here first for what they want to veganize. Aww you are so, so sweet, thank you so much Donna! I don’t have a gumbo recipe, but my hubby (being from Louisiana) has begged me to come up with one. I don’t know how I would do it with just 8 ingredients though, but I will try to create a very simplified version! Glad you loved it so much!